Bernardin’s is known for its exceptional food and impeccable service in a historic building that used to be an upscale restaurant institution in Winston-Salem. It’s one of the Triad’s only five-star establishments and considered a category unto themselves. 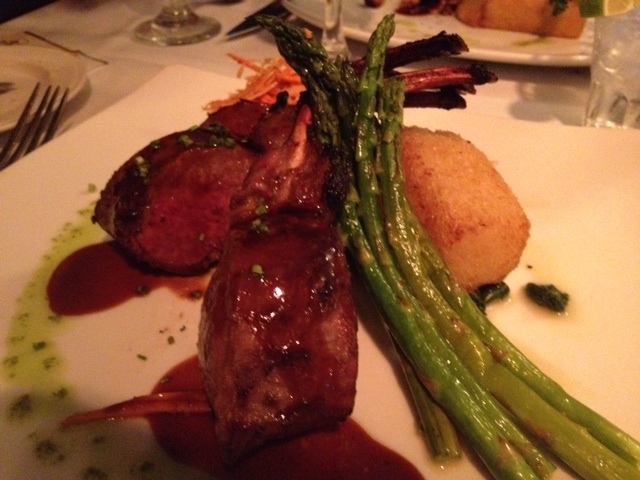 Mr. & Mrs. TriadFoodies celebrated 12 years of marital bliss by visiting Bernardin’s for the first time. We do this research for YOU, my fellow foodies. It’s a sacrifice I’m willing to make for you. First of all, Bernardin’s Zevely House has a beautiful, rustic, cozy atmosphere, perfect for a romantic anniversary dinner. But there’s plenty of space for dining with friends as well. 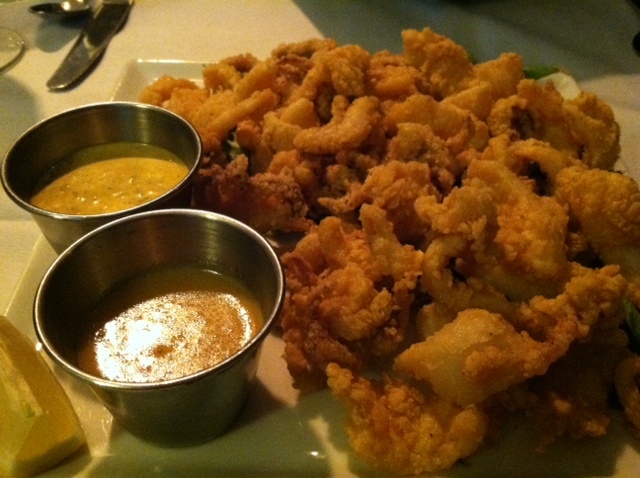 We decided to start off the evening with the Calamari…which was perfectly flash-fried and served with a wonderful spicy aioli and a sweet and spicy Chinese mustard. For me the measure of a great meal to come is if the Calamari is great and it was awesome. There are truly wonderful choices for dinner and a few specials didn’t make it easy to decide. There was KANGAROO on the menu this evening. I was intrigued but decided to taste something from the main menu because these items are staples and you will likely find them on the menu if you visit here. I chose the Muscovy Duck breast with root vegetables and a walnut fig sauce. I love duck. The little diced up veggies were crispy and caramelized, like veggie confetti. It was served with a side of creamy polenta, which interestingly, was in a triangle….crispy on the outside and creamy on the inside…don’t know how they did it. Wonderful, amazing, succulent. Mr. Foodie chose the Mongolian Australian Lamb Chop drizzled with an Asian BBQ sauce, with a crispy sticky rice cake and asparagus. Gorgeous, perfectly cooked. It Bernardin’s were a less refined place, I’m sure we would’ve been gnawing on the bones a little more. His back was to the room, so they got plenty clean. And for dessert…it’s our anniversary after all, we went with the recommended Chocolate Mousse Cake and the Raspberry and Peach Cobbler. Hubby chose the cake. It was so rich and moist and decadent. Perfect with a cup of coffee. And my cobbler was wonderfully tart and sweet with a light crust and a delicate praline ice cream and oh so beautifully presented. See our TriadFoodie beauty shots for peak. 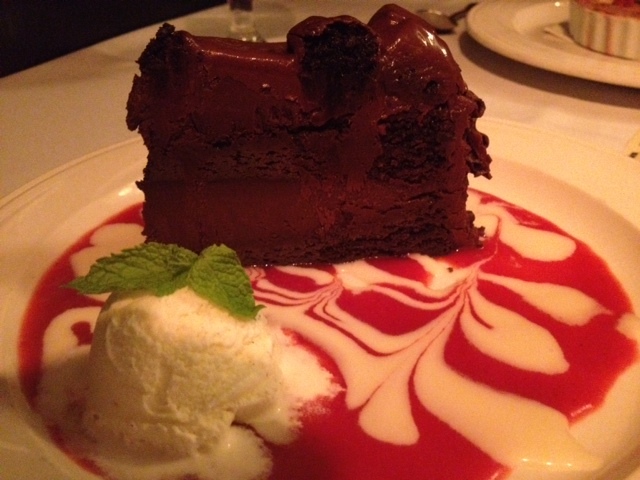 All in all, Bernardin’s was for me, a long-awaited experience. Prices for dinner are under $30. But they are also open for lunch with glorious entrees, sandwiches and salads. People, a fast food salad is $7.95. For two bucks more, you can eat at Bernardin’s and have an amazing meal and service, all the while supporting a local restaurant with an amazing history. Do you see why I’m so passionate? 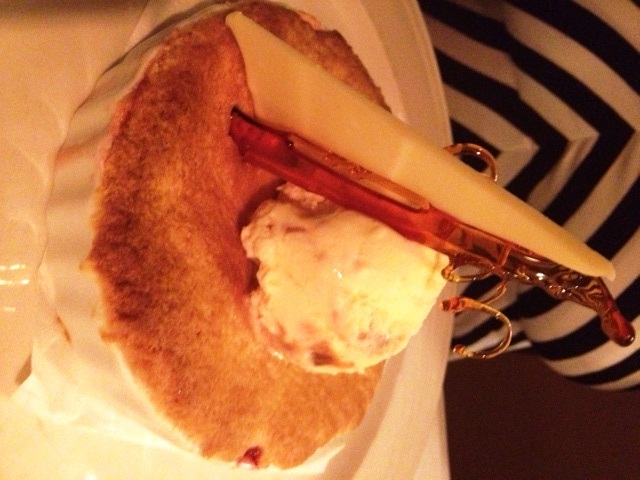 This entry was posted in You Should Eat Here! and tagged $$$, Dinner, Lunch, Winston-Salem on September 3, 2012 by triadfoodies. 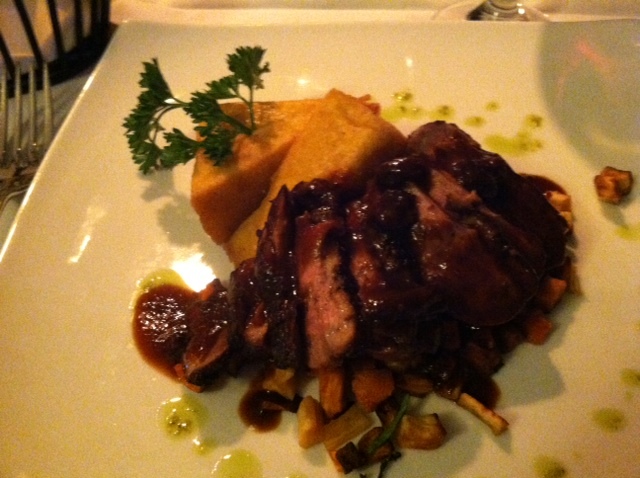 The picture and the description of the duck both provide strong impetus to get to Bernardin’s! Thanks for the review and the suggestion. Happy Anniversary, Foodies!